Even if you choose Final in the Reviewing tab and then save the file, the tracked changes will still show up when you reopen the document. Here’s how to really turn them off. This process also works in Word 2013. Step 1:Open the file in Word with the revision marks. Step 2:Under the Review tab, in the Changes group, click the Accept dropdown list. 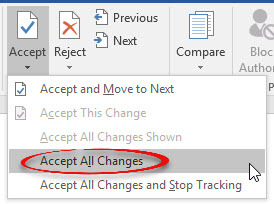 Step 3:Choose Accept All Changes in Document. Step 4:Click Track Changes to turn it off. It will no longer be highlighted grey. Step 5: Remove the comments. 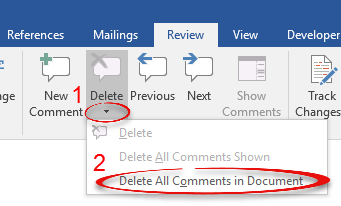 In the Review ribbon, in the Comments group, click Delete and choose Delete All Comments in Document. Step 6:Save the document. The next time you open it, the revision marks and comments will be gone.